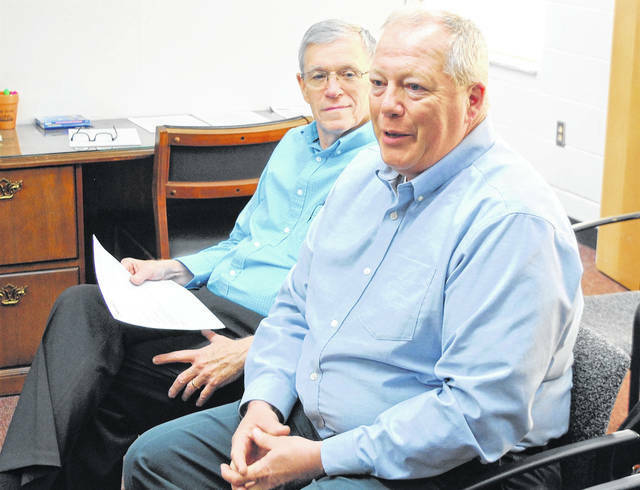 P. Dean Otworth, right, announced his resignation as Highland County engineer at Wednesday’s commissioners meeting, saying he was taking a position with the Ohio Department of Transportation in Columbus but would remain on the job as county engineer through April 30. Also pictured is Highland County Auditior Bill Fawley. Calling it a “bittersweet time for me,” Highland County Engineer P. Dean Otworth informed commissioners during their Wednesday meeting that he was leaving the post he has held for the past 26-plus years to take a position with the Ohio Department of Transportation in Columbus. Otworth said it wasn’t an easy decision and that he had “wrestled with it for a while,” but thanked both the commissioners and the people of Highland County. “Your institutional knowledge will be missed and you’ve been a great asset to the county,” Commissioner Gary Abernathy said. Prior to becoming the county engineer, Otworth said he was deputy engineer for seven years, serving the county for more than 33 years in the engineer’s office. Highland County Health Commissioner Jared Warner presented commissioners with his office’s annual report, which showed an increase in the number of immunizations, infectious disease tracking, animal bites and environmental health consultations. He said that 2018 was the first time in five years the health department didn’t lose money, pointing out that one of the reasons for operating in the black was not replacing some vacant staff positions. Warner also indicated money was still available to assist Highland County residents with septic problems and repairs, saying that a recent grant of $150,000 from the federal Environmental Protection Agency was earmarked for the 2018-19 fiscal year, and another grant for the same amount had been awarded for 2019-20. Tracy Evans and Dianna Fordyce of Grow! Highland County met with commissioners to bring them up to date on what the small business development organization has accomplished, and to seek guidance regarding securing future grants. The local economic development program has been in existence for the past eight years and has helped in both starting up new businesses and assisting those already in existence. She said the organization helps new businesses create a business plan, assists in tax IDs, graphic and web design, business logos, and offers guidance for social media, advertising and marketing, with services that are free and confidential to the business community. Fordyce pointed out the effectiveness of Grow! Highland County’s mission in what the organization has done to help business growth in Leesburg. Grow! Highland County has an annual operating budget of $34,000, which is funded by a United States Department of Agriculture grant and community donations from banks and organizations. In other matters, one line item budget transfer resolution was approved and commissioners agreed to an engagement letter with Bricker & Eckler Attorneys at Law for legal representation in the county’s dealings with two solar panel farm companies. They also agreed to sign a letter of support for Highland District Hospital in its current building expansion and renovation project, scheduled for completion in the summer of 2020. Duncan reminded those in attendance that they would be participating in a service to be held in honor of Highland County veterans of the Vietnam War. The ceremony will be at noon Friday at the Veterans Memorial behind the Highland County Courthouse. Commissioners then recessed and entered into a pair of executive sessions, both dealing with matters of economic development relating to the Willowbrook and Hecate solar farm projects.